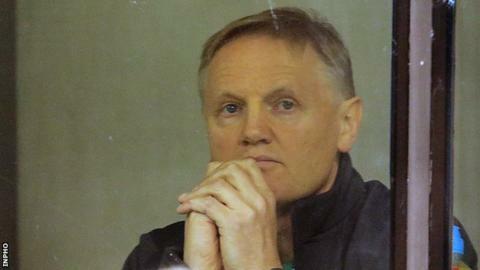 Ireland coach Joe Schmidt underwent an operation to have his appendix removed on Saturday evening, hours after masterminding his team's thrilling 26-23 win over Australia in Dublin. Schmidt made no direct mention of the illness in an interview with Irish broadcaster RTE after Saturday's game. However, an Irish spokesman said Schmidt had been "in agony all day". The IRFU said on Sunday morning that the New Zealander, 49, was "recovering well" following the surgery. "Joe would like to thank the doctors and nurses of St Vincent's Hospital and everyone for their well wishes and kind messages of support," added the IRFU statement. Schmidt did one interview with RTE following the game but did not attend the main post-match news conference. Asked whether Saturday's victory would boost his team's chances of retaining the Six Nations title, Schmidt said: "I'm just hoping to survive tonight." Ireland captain Paul O'Connell - who was named man of the match - said Schmidt had not spoken about his illness before the match. "He was as normal stand-offish," said the 35-year-old Munster lock. "He didn't come too close to us all day in case it was something catching. He didn't want to distract us from our focus. That's the type of man he is." Assistant coach Les Kiss added that Schmidt "toughed out the day" in typically understated fashion. "He's just going to be assessed. He's had some pretty bad stomach pains through the day," said Kiss. During his RTE interview, Schmidt praised his captain's display as the Irish refused to let victory slip in the manner of last November's heartbreaking defeat by the All Blacks. "There's a little bit of a sense of deja vu but it didn't quite look like it did last year," said Schmidt. "Paul O'Connell led from the front. There were a couple of fantastic tackles in that last set of Australian attacks. "You're 17-0 up after about 17 minutes, it's still pretty frustrating that you give them an opportunity to get back into the game and they don't need too many invites. "We got close and we were unlucky not to win, to be honest." "I thought we were passive in the first half. It wasn't what we'd planned. "They were quite the opposite. They bullied us in the first half." Australia coach Michael Cheika acknowledged that he was disappointed to lose on his return to Irish soil but the former Leinster boss says his team will now focus on next weekend's game with England at Twickenham. "We'll recover and mourn the loss because it was difficult, but we'll bounce back on Monday and do our best at Twickenham," added Cheika, whose side were suffering their second straight defeat after last weekend's 29-26 loss against France. "It was different from last week where I think we got close but we would have been lucky to win. "This week we got close and we were unlucky not to win to be honest."